Scotch Plains, NJ -- Mandolinist Barry Mitterhoff received a Lifetime Achievement Award at the 42nd Annual New Jersey Folk Festival. “I’m honored and excited about getting this Lifetime Achievement Award for playing and teaching bluegrass music in New Jersey over the last 47 years,” says Barry. The Lexington Music Awards seek to honor the present and past glory of Lexington's entire music industry. With 31 categories spanning the music industry including best female vocal artist, best male vocal artist, Song of the Year, best music venue, and best educator, this is truly a comprehensive awards program. The McLain Family Band was honored with the Lifetime Achievement Award. Also included are J.D. Crowe, Ricky Skaggs, Vince DiMartino, and J.P. Pennington. The awards took place Sunday, January 31st. Nashville, TN -- Last Wednesday night at the Americana Music Association's annual Honors and Awards ceremony, legendary country and bluegrass singer Ricky Skaggs was awarded the organization's esteemed Lifetime Achievement Award for Instrumentalist. From the stage of the historic Ryman Auditorium in Nashville, Tennessee, guitar legend Ry Cooder presented Skaggs with the award. Sunday, June 12th, The Charlie Poole Music Festival awarded their Lifetime Achievement Award to bluegrass guitar master Tony Rice. This is a great award and was almost on time for Rice's 64th birthday which he celebrated June 8th. Denise Holleman, Charlie "Sonny" Louvin Jr. and Kathy Louvin accept the Lifetime Achievement Award on behalf of the Louvin Brothers at the 2015 Special Merit Awards Ceremony & Nominees Reception on Feb. 7 in Los Angeles. This Special Merit Award is presented by vote of The Recording Academy's National Trustees to performers* who, during their lifetimes, have made creative contributions of outstanding artistic significance to the field of recording. 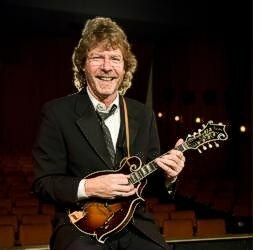 The Northern California Bluegrass Society has announced that Bob Cole, Charlie Cran, Penny Godlis, and Chris Stevenson will receive Lifetime Achievement Awards at the 2015 Northern California Bluegrass Awards. The January 24 ceremony & concert in Redwood City are part of the free weekend-long NCBS Bluegrass On Broadway Festival.